the county. My oldest son is 13, in middle school, the high school marching band, plays golf for the school and is also a boy scout. My daughter is 12, in the middle school, in chorus and plays golf for the school. My youngest is full of energy and is a wolf in cub scouts. Needless to say we do not have a lot of down time and body odor is just one of things that I do not want to worry about. Every morning when we get in the car I always ask my kids-"Did you put on your deodorant?" It has become a running joke with my kids to just say-"No, mom, we like to smell bad!" They always seem to think it's funnier then I do. I always say something like-"Fine, be known as the smelly kids." 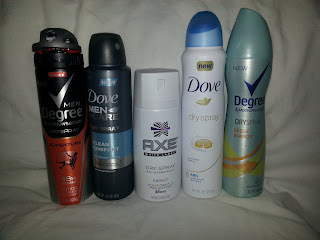 My family is so blessed to be able to partner with Unilever this holiday season to bring you the full-range of Dry Spray Antiperspirants. There are 5 dry sprays in the collection that offer 48 hour odor and wetness protection. 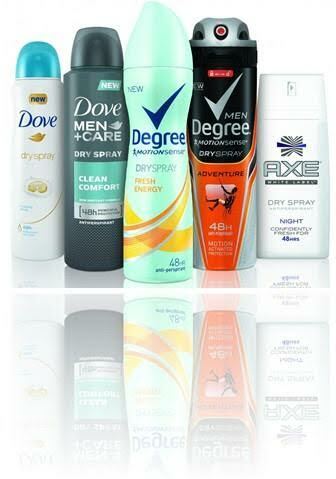 Unilever offers a complete line of protection for your busy lifestyle. I no longer have to question or worry if my family will be the "smelly family". My family loves the fact that with the dry spray line there is no wet and sticky feeling. The sprays are light, airy and have you covered for 48 hours of no smell and no worry. Make sure to visit each of these brands twitter today to learn more: Dove, Degree Women, AXE, Degree Men and Dove Men Care.